After finishing the last 3 baby knits (buttons, too! just waiting on sunshine for photos), I've been hunting around for the next project. 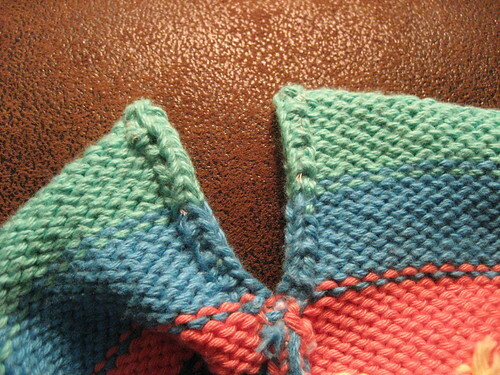 I wasn't sure I wanted to knit another baby knit. I really want to knit a sweater for myself, but figure I should wait to see what my body will look like post-delivery. I made some progress on the Summer Anklets, the blue/orange socks I recently started; but then wanted to photograph the colors in the skein (again, waiting on sunshine), so that's on hold. Instead of starting a bunch of new projects, I decided to look at my WIP's and finish something if possible. 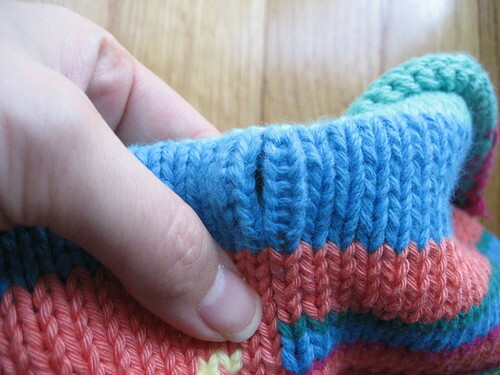 My WIP list jumped up to 22 with the baby knits -- not good! Pseudo, because I stranded the main color instead of joining a new ball of yarn. I've sewn the lining, but, being totally clueless about sewing linings, it's on the smallish side. 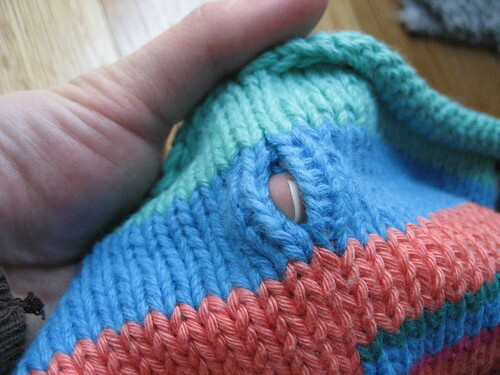 I'd like to sew another lining that fits better. After all this work, it makes sense to, no? I spent a good hour trying to figure out why my first post wouldn't appear. It worked fine on my local test setup, but no matter what I did, just wouldn't show up! Finally, I added a test post and it showed up right away! But the post time was one hour earlier. Aha. Time zone difference. I want my hour back! 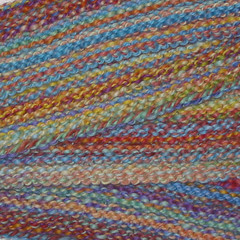 Once I realized the striping effect of their yarn (I bought 3 different skeins), I wanted a different pattern for the next one that would make it less... stripey. 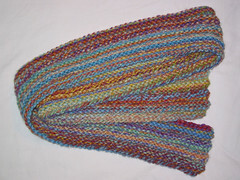 I tried the Short Row Rib scarf on Magknits but the colors were too strong for the pattern (at least for me). But I liked the three row rib thing going on, so I frogged, cast on length-wise, and did the whole thing in three row rib. The colors are still too bright for me, but I like how they blend more. 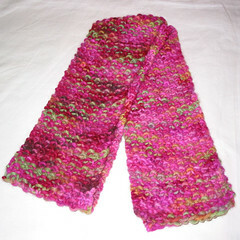 It's a good length scarf, too, will make a nice gift. 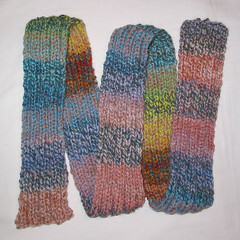 Here are a few cashmere scarves that I knit as gifts. All are handdyed by Danette Taylor, and took 2 skeins. (Which is to say, I used 2 skeins and stopped when I ran out. If cashmere weren't so durned expensive, I would probably use 2 1/4 or 2 1/2 skeins.) 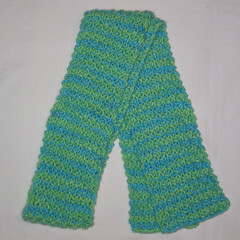 They are wonderfully soft and buttery, to wear and to knit! 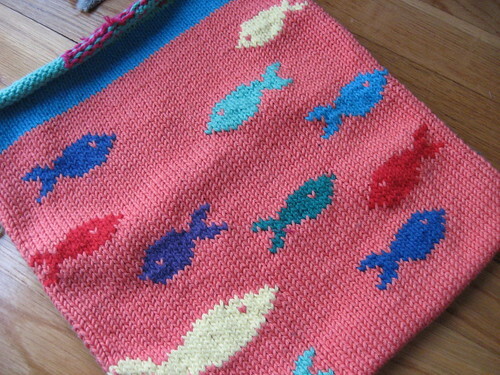 They were all knit on #13 needles over 13-14 stitches. 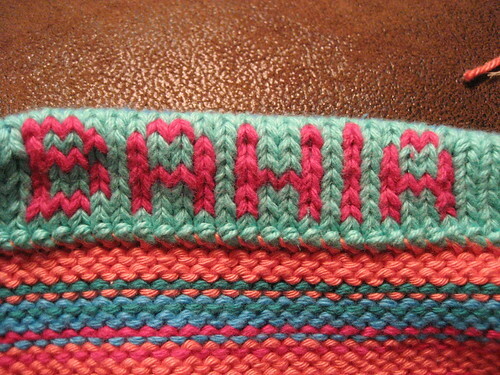 This first is in her Azaleas colorway. This one is going to my mum. 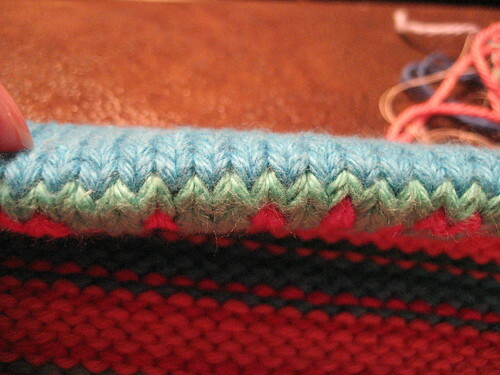 Simple seed stitch pattern. One skein is more red, but I wasn't too concerned. 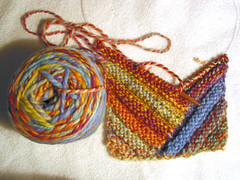 The next two are in her Summer Rain colorway; the first is... hmm, what is it called, elongated seed stitch? I think there's a name for it... 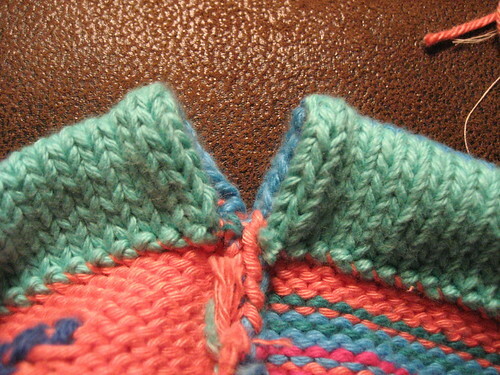 The second is just seed stitch. These are "wedding thank you" gifts to be sent out soon. And finally, the bag! 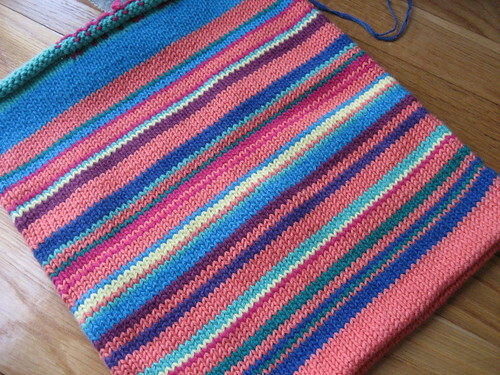 I knit this on the road and finished it a couple of days before we came home. It was meant for the camera, so in the end, not so useful. Yet. 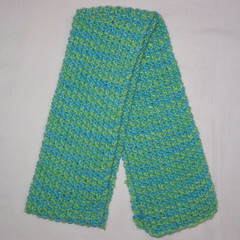 I used Debbie Bliss Cotton Denim, about 1.5 skeins, knit on #5 needles. 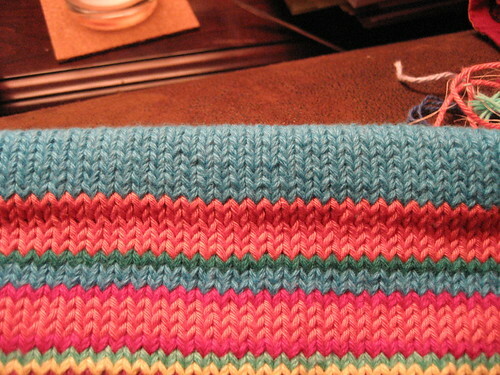 Liked the yarn, but wasn't so crazy about it on #5's, too small. 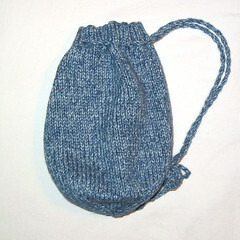 But, wanted a tight knit so the bag wouldn't stretch out.